A former Vatican ambassador to Washington said Sunday that he told Pope Francis in 2013 about allegations of sexual abuse against a prominent priest – and that Francis took no action. Now, the former official, Archbishop Carlo Maria Vigano, is calling for Francis to step down. Vigano made the claims in a lengthy statement that concludes with a call for Francis’ resignation: “In this extremely dramatic moment for the universal Church, he must acknowledge his mistakes and, in keeping with the proclaimed principle of zero tolerance, Pope Francis must be the first to set a good example to Cardinals and Bishops who covered up McCarrick’s abuses and resign along with all of them,” he writes. Vigano, who retired in 2016 at age 75, described an exchange with Francis on June 23, 2013, shortly after he became pope, about Cardinal Theodore McCarrick, the former archbishop of Washington D.C., who resigned last month over claims he sexually abused seminary students and an altar boy. 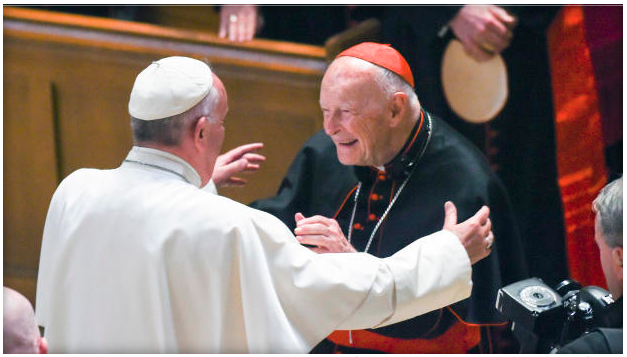 Pope Francis accepted McCarrick’s resignation on July 28. McCarrick has maintained his innocence. This month, a Pennsylvania grand jury issued a report that said more than 300 priests abused more than 1,000 children, and likely thousands more, over seven decades. In his statement, Vigano wrote that Wuerl also knew about McCarrick. “His recent statements that he knew nothing about it … are absolutely laughable. The cardinal lies shamelessly,” Vigano wrote.